The WinForms ComboBox (aka Multiselect ComboBox) control’s rich feature set– includes editing, autocomplete, multiselect items using checkbox, sort and more. The WinForms ComboBox (Multiselect ComboBox) Control allows users to type a value or choose an item or multiple items using multiselect option . Any UI control can be loaded as the header of the dropdown. Users can perform customized actions like search and filter in the dropdown. It’s rich feature set includes autocomplete, sorting, watermark text, appearance customization, and more. The WinForms ComboBox has data binding support to work out-of-the-box with all popular data sources like IEnumerable (IList, IBindingList, ObservableCollection, and more) and DataTable. It also supports sorting and filtering. Data can be shown based on the display member and value member. The WinForms ComboBox (multiselect combobox) provides support to select multiple items from the dropdown. Users can select multiple items by using the intuitive checkbox in each item in the dropdown. It also supports confirmation buttons (OK and Cancel) in the dropdown and select all option similar to Excel. Support to load and freeze the header and footer at the top and bottom of the dropdown list in ComboBox. Load any UI control as the header or footer of the dropdown. This helps users to perform customized operations like search and filter in the dropdown itself. Displays the list of items in the dropdown based on the typed text in edit control. Users can perform case-sensitive autocompletion . Built-in support to suggest items that starts with text or contains. Completes the user typed word from the suggestion text. This helps users to search for the correct items easily. Select an item from the dropdown list based on the appended word in edit control. Completes a word that the user types from the suggestion text and filter the suggestions. Users can choose an item from the filtered list. Sort the items in the drop-down either in the ascending or descending order. Users can sort items by writing their own custom logic. The WinForms ComboBox allows users to filter data. Users can filter items with their own custom logic. Watermark provide additional hints to the users about the data to be selected from the listed values. Styling - Customize the appearance of the edit control and drop-down list. 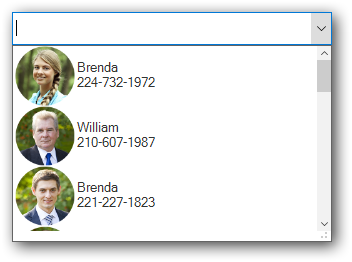 Conditional styling - Customize the appearance of the dropdown list items based on the data. Image in drop-down - Users can load an image to each list item in the dropdown. Also, supports image alignment with text. Custom drawing - Supports making a custom drawing for every list item. Users can adjust (auto fit) the item height in the drop-down based on the content of an item to enhance readability. It is also possible to set the item height conditionally. Change the height and width of the drop-down. Resize the drop-down dynamically using an intuitive resizing thumb. 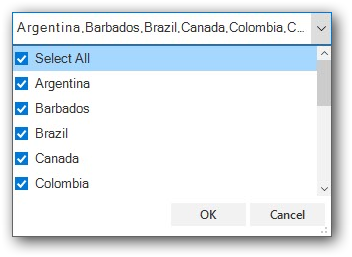 Localize all static default strings in the WinForms ComboBox to any desired language.